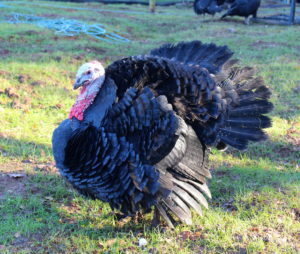 Organic Reared Turkeys available to order now! 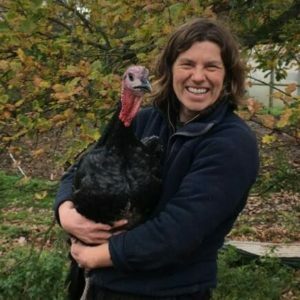 The Poultry Paddock teamed up with local farm and food business “Keepers Cottage Organics” to rear a small flock of high welfare Turkeys for Christmas 2016. It was an outstanding success. We’re doing it again in 2018. Feedback from customers and my own taste buds was great and by boxing day we’d already got several orders for “same again next year”. It’s an end to end production for us, we start with young poults in May / June, rear them, process them ourselves on the premises at New House Farm and only sell direct to the end customers. There are 3 types of domestic Turkeys, White Bronze and Black. The Whites and Bronze birds are usually used intensive production of Christmas Turkeys because of their faster growth rate and superior feed conversion. The Whites usually occupy the value end of the market. The Bronze breeds are often marketed as a superior product. 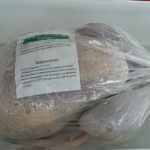 It is the Black turkeys that occupy the premium end of the market though and it is these only these that we supply. 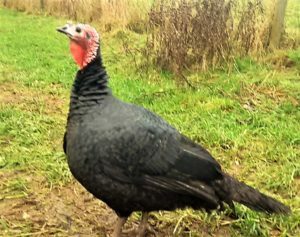 The Blacks are a slower growth breed, very closely related to the original Spanish Black Turkeys that were introduced to Europe in the 16th century by Spanish explorers. We choose Blacks because their slower rate of growth provides a more flavourful taste and better textured meat, but also because they are a hardy breed. This year (2018) we’re rearing two flocks, one as organic free range on the organic pasture at New House Farm and one in woodland nearby. 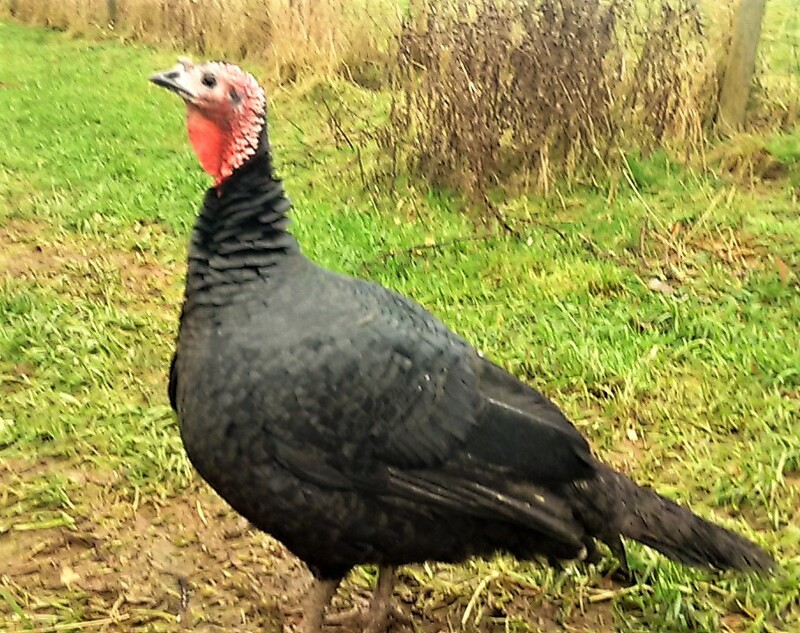 The Woodland turkeys are the same breed of black turkeys that we have used for the last 4 years, the organics are extra special, a genuine heritage breed. They’re extra slow growing and have a more graceful build. They’re free range, allowed to forage through the day on the organic pasture and their supplimentary feed is organic GMO free cereal based. Both flocks will be processed on site. By choosing slower growing hardy breeds of poultry we know that we can put them in a free range environment and they will have no trouble coping with our weather conditions. Although some of the fast growing commercial breeds can be used in free range systems, it is our experience that they are less able to enjoy a free range lifestyle. Fast growing breeds often prefer a lethargic indoor lifestyle, whereas we like to see our poultry roaming in a natural habitat, able to run, play and even fly a bit. In the UK all poultry sold as “Free Range” must meet criteria that ensures that they have a certain amount of access to the outdoors. Poultry can be reared in Intensive production systems (Large sheds with 1000’s of birds in a flock) and as long as they meet the criteria for Free Range, they can be sold as “Free Range”. Our Poultry is not raised intensively. Our flock sizes are small and rather than giving them “access to the outdoors”, we take the view that they should be reared outdoors and given “access to the indoors”. Our high welfare approach to rearing poultry extends to welfare at the time of killing. Our birds are slaughtered on the same holding that they were reared to spare them from a stressful journey to an abattoir. We are licenced to slaughter and we adhere strictly to all of the government guidelines for food standards and welfare at the time of killing. The Turkeys are humanely stunned as part of the slaughter process; this renders them immediately insensible to pain. Our birds are dry plucked which is the traditional way of preparing turkeys. The more common way of plucking poultry nowadays is the wet plucking method; this requires the carcass to be scolded in hot water so that the feathers are loosened and can be rubbed off in a machine. We choose to dry pluck our birds because although It is a time consuming manual process it preserves the bloom on the skin and avoids raising the temperature of the bird which could reduce shelf life of the product. It is inevitable that plucked poultry is supplied with some pin feathers and bristle remaining on the skin. This is a feature of a traditional turkey. 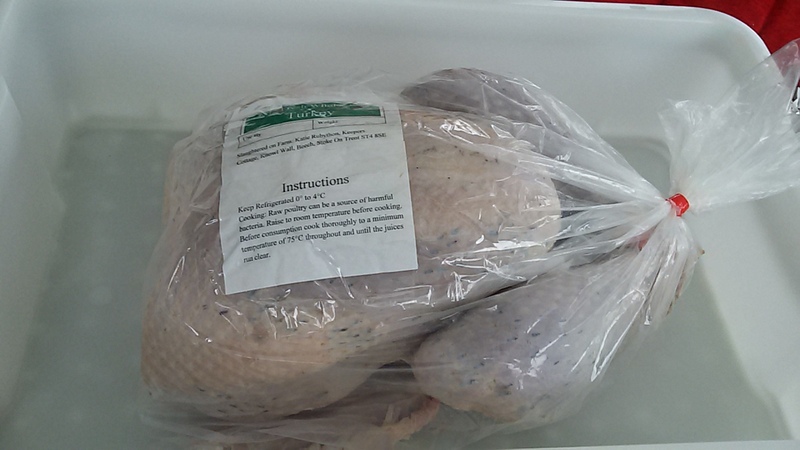 Our Turkeys are matured by hanging in a chiller for a number of days to “rest” and tenderise the meat. They are eviscerated shortly before they are packaged and transported for sale. This “delayed evisceration” process provides a stronger tasting meat. The flesh also degrades faster after evisceration. We only sell our turkeys direct to the customers, there is no middleman so we offer them considerably cheaper than the retail price for equivalent quality birds (£14 per kg is typical retail price for Black free range Turkeys).